This chapter is a synthesis of new knowledge, procedures, best practices and references for collecting plant diversity since the publication of the 1995 volume Collecting Plant Genetic Diversity: Technical Guidelines, edited by Luigi Guarino, V. Ramanatha Rao and Robert Reid, and published by CAB International on behalf of the International Plant Genetic Resources Institute (IPGRI) (now Bioversity International), the Food and Agriculture Organization of the United Nations (FAO), the World Conservation Union (IUCN) and the United Nations Environment Programme (UNEP). The original text for Chapter 17: Plant Health and Germplasm Collectors, authored by E. A. Frison and G. V. H. Jackson has been made available online courtesy of CABI. The 2011 update of the Technical Guidelines, edited by L. Guarino, V. Ramanatha Rao and E. Goldberg, has been made available courtesy of Bioversity International. When plant germplasm is moved nationally or internationally, there is a risk of the concomitant movement of pests (insects, pathogens, weeds and other organisms). Further, the quality of samples may be compromised by pests affecting viability during storage or, later, during multiplication and characterization. This chapter suggests what collectors need to do to minimize these dangers. It is divided into (1) what to do when planning collecting missions (assembling the pest information, plant-health documents, intermediate quarantine, pest identification), (2) what to do in the field (minimizing the pest risk, record keeping, preservation of pest specimens), and finally, (3) what to do back at the base (preparing samples for inspection, phytosanitary treatments and certification, documents, and preparation of pests for identification). If followed systematically, these guidelines will facilitate plant germplasm reaching its destination unhindered, and will contribute to its value. Uncontrolled movement of plant germplasm between countries spreads pests, but regulation of the movement of plant germplasm can help to reduce these risks. Pests, as defined by the International Plant Protection Convention (lPPC) (https://www.ippc.int/index.php?id=1110589&L=0), are “any species, strain or biotype of plant, animal or pathogenic agent injurious to plants or plant products” (IPPC 2010). (The IPPC facilitates cooperation between contracting parties to protect the world’s cultivated and natural plant resources from the spread and introduction of pests of plants, while minimizing interference with the international movement of goods and people. )There are those that can be easily seen with the naked eye, such as insects, mites, slugs and snails, rats, plants and seeds, and those that are microscopic, such as fungi and the like, bacteria, phytoplasma, viruses and viroids. Previously, pests were considered to be only those organisms potentially damaging to crops, but now the term pest also includes newly introduced organisms that might damage ecosystems and plant and animal biodiversity. Because there are dangers inherent in the movement of plant germplasm, most countries have legislation to regulate the entry (and sometimes the internal movement) of plants, plant parts and their products. In particular, the movement of wild collected germplasm causes significant concern, as its pest status is likely to be poorly known. Consignments of germplasm arriving in the importing country without proper documentation will be treated, reshipped or destroyed, irrespective of their botanical significance, the type of pest infestation or the status of the collector. To reduce the risk of accidental transfer of pests, germplasm should always be collected, processed and shipped in compliance with the phytosanitary requirements of the importing country. Contact details of most countries’ plant quarantine services can be found on the IPPC website. It is possible, from long experience and sheer weight of knowledge of a plant species, that collectors might be better informed about the possible presence of quarantine pests associated with plant germplasm than the authorities in the importing country. In such cases, they should divulge this information, while at the same time ensuring that the germplasm collected and dispatched is free of pests to the extent that is possible. There are other, perhaps less obvious, reasons why pests should be given attention when germplasm is collected. Pests might affect the quality, and therefore the usefulness, of germplasm samples. Infection by pathogens can reduce the viability of seeds during storage. When material is multiplied, growth may be distorted, colours altered and disease susceptibility increased. These changes may make it difficult, if not impossible, to collect characterization and preliminary evaluation data, and some important characteristics, crucial for plant-improvement schemes, might go undetected. In addition, infested samples are unlikely to be distributed. They cannot be grown out and regenerated and, if stored, they will remain unused and will deteriorate. It is, therefore, important to know what pests are likely to be associated with the target gene pool. This will allow an assessment of the risks associated with moving the germplasm, as well as providing for appropriate measures to be devised to reduce the risk to a minimum. It is also important to document any pests present on the target species at the time of collecting. This information, part of the passport data of the sample, will improve the usefulness of the germplasm and will also help during quarantine examination. For all these reasons, it is often useful to include a plant-protection specialist in collecting teams if funds and logistical considerations allow. Preferably, this should be a plant pathologist experienced in the species to be collected, as pathogens are more difficult than insects and mites to detect during collecting and to eradicate from plant samples. If a plant-protection specialist cannot participate in the collecting mission, collectors should become familiar with the major pests of the target species. In all cases, collectors will have to ensure that the phytosanitary requirements of the importing country have been met and proper documentation has been assembled so that plant samples reach their intended destination unhindered. This chapter gives guidelines on how these issues may be addressed. It considers what must be done at the planning stage, while collecting in the field and, finally, just before samples are dispatched. What pests have been recorded on the target species in the country of collecting, especially in the target area? What plant parts are they found on? How are the pests transmitted? What is the final destination(s) of all samples, including subsamples? What are the phytosanitary import requirements of the country(ies) of destination? What are the procedures for obtaining a phytosanitary certificate in the country of collecting? What are the procedures for verifying that the phytosanitary requirements of the importing country have been met prior to export? Since the first edition of this document was published, there has been an enormous change in the availability of information on plants and other organisms. The internet now allows immediate access to the most up-to-date information available in publications, research centres and museums worldwide. Perhaps the first point of contact for a collector seeking information on a plant or pest is to run a search for a pest under its presently accepted name (and at least one of its synonyms) through a search engine such as Google, Bing or Yahoo. This will generally turn up several significant leads for further enquiry, often with researchers familiar with the species being searched. There are now literally hundreds of databases publicly available over the internet, and many others with restricted access for either commercial or confidentiality reasons. A selection of these is provided in the reference section, below, along with a selection of texts that may be consulted for information on the pests of specific crops. For example, the American Phytopathological Society publishes a particularly useful set of documents on the identification of crop plant diseases (www.cplbookshop.com/glossary/G583.htm). The CABI Crop Protection Compendium (CPC) (www.cabi.org/cpc) is also a useful source of information on some 3000 pests, diseases, natural enemies and crops (with 400 recently commissioned sheets added in 2010) and basic information on 27,000 more species. The CPC helps with pest identification and distribution (including maps) and with phytosanitary and quarantine issues. On viruses, CABI and the Australian National University have collaborated on a major database: the Virus Identification Data Exchange (VIDE). Viruses of Tropical Plants (Brunt et al. 1990) is an output of the database, as is Plant Viruses Online: Descriptions and Lists from the VIDE Database (Brunt et al. 1996). This site also provides links to some excellent web sites on plant viruses. Many of these research centres publish useful illustrated guides to the pests of their mandate crops. These are particularly useful in the field. The CGIAR also has an online portal, the Crop Genebank Knowledge Base (http://cropgenebank.sgrp.cgiar.org/index.php?option=com_content&view=article&id=137&Itemid=238&lang=english), with guidelines for the safe transfer of germplasm for 15 seed crops and five clonally propagated crops under the mandate of CGIAR germplasm banks. In the introduction, the website states that it “summarizes information on current practices and guidelines for the safe transfer of germplasm gathered from the seed and crop health laboratories from CGIAR Centres in charge of the different crops”. For each of the crops of interest there are sections on (1) germplasm import and export requirements, (2) technical guidelines for the detection and treatment of pests and pathogens and the safe transfer of germplasm and (3) best practices in place at the CGIAR Centres. There are many older texts that have crop-by-crop analysis of the problems and risks attendant on the transfer of plant germplasm, such as Hewitt and Chiarappa (1977), and these, too, can often contain information that remains useful. Finally, pest surveys might also be consulted, if available, to determine which pests have been recorded on the target species in the collecting region. However, in many countries, such surveys are far from complete: sometimes, they have not been done at all, are outdated or do not cover the entire country, concentrating on the more easily accessible areas. Another problem is that pest surveys tend to record pests of crop plants, neglecting wild relatives, and rarely include native plants. This lack of information is a major barrier to the formulation of quarantine regulations appropriate to the exchange of germplasm of many plant species, including crop species. It is essential to begin making phytosanitary arrangements early in the planning phase of any collecting expedition. Delays in obtaining the appropriate documents are common, but without these documents, the mission might have to be postponed or, worse, the samples destroyed. It is the responsibility of collectors to obtain the necessary documents in order to transfer plant germplasm. Two documents are commonly required for international plant transfer: an import permit and a phytosanitary certificate. The import permit must be obtained from the country or countries of destination of the germplasm well before the mission sets out. Information is also needed on how to obtain a phytosanitary certificate in the country of collecting and whether other authorizations are required to export germplasm, such as authorization under the Convention on International Trade in Endangered Species of Wild Fauna and Flora (CITES), which is an international agreement between governments that aims to ensure that international trade in specimens of wild animals and plants does not threaten the survival of these species. The FAO/IPPC Secretariat has a list of plant-protection services worldwide with contact addresses of the authorities responsible for issuing these documents. This list is available online at https://www.ippc.int/index.php?id=1110520&no_cache=1&type=contactpoints&L=0. Regulations differ among countries according to the perceived risks involved in making the importation; the conditions of entry will be detailed on the import permit. Treatments may be required both in the country of export and in the country of import. If sub-samples are to be sent to several countries, permits must be obtained from each one. When no conditions apply and germplasm is allowed unconditional entry, it is advisable to obtain a document from the plant-protection service of the importing country to that effect. This will facilitate inspections at the border. Usually, two copies of the import permit are provided. The top copy should accompany the consignment (if there is to be only one) and the other copy should be retained by the collector. A photocopy is usually allowed for multiple consignments. It is recommended that collectors advise the importing phytosanitary border authorities of the number and approximate size of samples well ahead of arrival, so that the quarantine inspection service can plan to process the samples quickly. If the plants are to be grown in post-entry quarantine in the importing country or in a third country, then arrangements for this must be made during the planning phase of any expedition to ensure that facilities and space are available when needed. The phytosanitary certificate is issued by the quarantine authority of the exporting country, certifying that the product meets the phytosanitary regulations of the importing country. Consignments are inspected and the certificate issued if they are “free from quarantine pests and practically free of injurious pests” (see the IPPC model phytosanitary certificate, appendix 17.1 at the end of this chapter). A “quarantine pest” is different from a merely “injurious pest” in this statement in that it is of potential national economic importance to the country and not yet present there, or present but not widely distributed, and being actively controlled (IPPC 2010). In some instances, in order to reduce the overall pest risk, germplasm consignments will need to be given phytosanitary treatments in the country of origin (see chapter 20 on the potential risks for seed viability of such treatments). Fumigation may be requested or the samples may be dipped or dusted in an insecticide or fungicide, given a hot-water treatment, or whatever is considered appropriate by the importing country. The treatments should be applied exactly as requested. If the collector is not confident that a treatment will be applied correctly in the exporting country and that it might fail to control the pest or that the germplasm might be damaged, it may be possible to negotiate with the importing country to have the treatment done under secure quarantine after arrival there. The permit may seek “additional declarations” verifying that these treatments have been applied as required. These, as well as details of the treatments, must be specified/declared on the phytosanitary certificate. Finally, the certificate should be signed by the authorized government representative. Under no circumstances should alternative treatments to those specified on the import permit be applied without first requesting the authority of the importing country. Alternative treatments may be ignored by the importing quarantine inspector and a second treatment applied, which could reduce the viability of the germplasm. Likewise, if no treatments are requested, none should be given, since importing countries may wish to inspect or test germplasm consignments, and treatments already applied to seeds, for instance, may mask symptoms of seed-borne pathogens and interfere with laboratory tests. If seeds are treated prior to entry, contrary to the conditions of the permit, this could seriously jeopardize their importation. Where germplasm samples are to be sent to more than one country, it is necessary to obtain phytosanitary certificates that comply with the requirements of each destination. It is important that the certificate(s) should be issued without amendment or erasure. Many countries refuse to accept altered certificates. A fee may be charged for fumigation or disinfection treatments and, occasionally, for inspection. Two copies of the phytosanitary certificate should be obtained, if possible. If there is only one, then the collector should make a copy. The original phytosanitary certificate should accompany the consignment and the copy should be kept with the other records of the collecting mission. Collectors are responsible for arranging the documentation for germplasm samples that have to be grown in intermediate (third-country) quarantine. Such arrangements are necessary when it is unsafe to make transfers directly to the importing country. Procedures are essentially similar to those outlined above: an import permit must be obtained from the quarantine authority of the intermediate country. A copy of this should accompany the consignment, together with the phytosanitary certificate showing any treatments or endorsements requested on the permit. After the samples have been grown in intermediate quarantine and declared safe for further transfer, an import permit must be obtained from the country of final destination and a new phytosanitary certificate issued by the intermediate country. Misidentifications of pests can seriously jeopardize the usefulness of consignments. Identification services for fungi, bacteria, nematodes are provided by CABI Global Plant Clinic (www.cabi.org/default.aspx?site=170&page=1017&pid=2301). Costs vary depending on whether or not a country is a member of CABI. CABI also publishes useful directories of organizations, such as the International Mycological Directory (Hall and Hawksworth, 1990). It may be possible to arrange with the Danish Government Institute of Seed Pathology for Developing Countries (in Hellerup, Denmark) for the identification of important seed-borne diseases of tropical countries. Identification of virus and virus-like infections is more problematical. Specimens need to be sent to institutes specializing in particular crop plants. Lists of institutes providing this service (such as the Tropical Virus Unit at the Institute of Arable Crops Research, Rothamsted Experimental Station, UK) can be found in the appropriate booklet in the FAO/IPGRI series of safe transfer guidelines. CABI also gives advice. Identification of arthropods and many other biota can be obtained at a cost through the Natural History Museum, South Kensington, UK (www.nhm.ac.uk/about-us/contact-enquiries/identification-and-general-science-enquiries/index.html), and many other museums. In all cases, arrangements must be made well ahead of dispatch to allow the orderly processing of specimens. Import permits may be needed. If so, these must be obtained from the appropriate authorities in the country where specimens are to be examined. Collectors should ensure that the institutes making the identifications know where to send the results. Familiarity with the symptoms caused by pests and with which plant parts are most likely to be contaminated by the pests of concern is essential. In general, the risk of spreading pests with germplasm is greatest if rooted plants are moved. This is because of the likelihood that nematodes and other soil-borne pathogens will be present; these are difficult to treat without destroying the plant tissues. Other types of vegetative propagating material (e.g., stems, bulbs, corms, etc.) also present a risk, mainly because of infection from systemic pathogens. The international movement of seeds and pollen is considered safer, as fewer pests are harboured by these plant organs. Phytosanitary considerations may therefore contribute to the decision as to what plant part(s) to collect. It may be possible to apply curative treatments to lessen or eradicate the pest risk. For surface-borne pathogens and insects, pesticide treatments and fumigation may be tried. Where virus, virus-like organisms and internally borne fungi and bacteria are a threat, thermotherapy and shoot-tip culture are most appropriate. For vegetatively propagated species, transfer of germplasm as in vitro cultures will greatly reduce the pest risk. Nevertheless, it should be stressed that in vitro cultures do not eliminate the risk entirely. They should be complemented by indexing (testing) for viruses and virus-like organisms that are likely to be present in the area where the germplasm was collected. The technical guidelines for the safe transfer of germplasm give general advice to collectors on the type of germplasm considered safe to move internationally, as well as detailed technical recommendations on how the germplasm may be treated to ensure that it is free of pests. In some instances, because of the severity of the pest and the difficulty of collecting healthy material from the field, the guidelines advise on transfer of material through a third country, where therapy and indexing procedures can be carried out to ensure freedom from internally borne pathogens. The general recommendations of the guidelines are useful even for crops not specifically covered in the series to date. It is important for collectors to record the pests present on their target species and to note whether other pests are present in the target region. Noting that plants are free of pests in an area where pests are common is equally important. Collectors should attempt to describe the symptoms caused by pests. It is, however, often difficult for someone untrained in plant pathology or entomology to do this. Symptoms may be caused by a combination of several pests, or the causal agent may be obscured by the presence of a minor one or by an opportunistic saprophyte. Symptoms due to root attack or internal pathogens are often particularly difficult to interpret. Where there is doubt as to the identification of pests, plant specimens showing typical symptoms should be collected and dried or preserved by other means, as appropriate (see below). Rating the severity of attack, both in terms of its effect on the individual plant(s) affected and in terms of the percentage of the population affected, will increase the value of the information. Descriptor lists are published by Bioversity International for many crops, cataloguing the important pests and giving scales of severity. These are available online at www.bioversityinternational.org/research/conservation/sharing_information/descriptor_lists.html. Colour photographs showing the full range of symptoms, including close-ups of damaged areas and of the pests themselves, are often useful diagnostic tools (Sonoda 1979). Farmers’ knowledge of pests can be extensive and detailed. Some examples are given by Altieri (1993). Collectors can often complement the kinds of observations described above with discussions with knowledgeable local people. Correct identification of pests depends on the quality of the specimens prepared in the field. Collectors should be equipped at least with specimen bottles, alcohol (75% isopropyl alcohol) and formalin for preserving insects, mites and nematodes, and with newspapers and plant presses for making dried herbarium specimens of plants with fungal and bacterial diseases (chapter 27). Specimens may need to be shared among several institutes, and sufficient material should be collected to allow this. Sonoda (1979) gives guidelines on capturing, killing and storing insects and other pests in the context of germplasm collecting. For insect pests, representative specimens of all life stages may be necessary for taxonomic identification. Insects can be captured using nets, by beating plants over a cloth or by using an aspirator. They can be killed using potassium cyanide or ethyl acetate, both of which are dangerous and should be clearly labelled and stored properly. Some insects must be pinned (e.g., beetles, flies and wasps); others can be stored in alcohol (e.g., caterpillars and other larvae, ants, aphids, scales and mealybugs) and others can be stored in small envelopes (e.g., moths and butterflies). Dried specimens of diseased plants should include as much of the plant as possible, showing both old and new lesions. Fresh specimens can also be collected and stored in plastic bags. They will remain useful longer if refrigerated. Fungal and bacterial pathogens may be isolated from diseased plants in the field, but this requires sterile techniques and is not often feasible in the context of plant germplasm collecting. Plants infected with viruses or virus-like organisms present the collector with the greatest challenge, as the material needs to be processed in different ways according to the type of pathogen. Where tissues are thought to contain non-cultivable mollicutes (formerly referred to as mycoplasma-like organisms), they need to be fixed in glutaraldehyde; whereas, tissues for virus examination may be sent fresh, dried as thin (1mm x 10mm) sections over calcium chloride (or silica gel) or as sap stained on electron microscope grids. Because of the complexity of the subject, it is essential that, prior to departure, collectors seek advice on the preservation of specimens from the institutes where the specimens are to be sent for examination. Details of methods of preserving various kinds of diseased material can be found in The Plant Pathologist’s Pocketbook (Waller et al. 2001). Methods for collecting and preserving different insect groups can be found in Bland and Jacques (1978), Borror et al. (1976) and British Museum (Natural History) (1974). 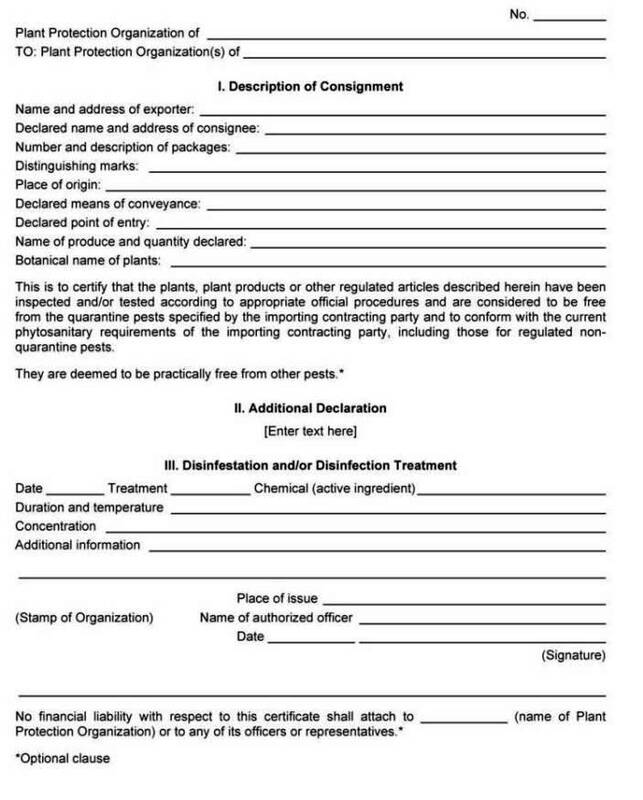 This section gives a summary of the phytosanitary procedures involved in handling plant germplasm after it has been collected, along with brief notes on the dispatch of specimens for pest identification. For other aspects of the tasks that will need to be undertaken once back at base, see Chapter 28. Missions should carefully prepare germplasm samples before they are presented to quarantine authorities for inspection, treatment and certification. Germplasm samples should be carefully inspected for pests, insects and mites as well as for lesions or colour patterns that might denote fungal, bacterial or viral pathogens. Where such pests, or symptoms of pests, are present, the pests and/or the symptom-bearing seeds should be removed. Bare-rooted plants should be thoroughly washed to ensure they are free of soil, which might harbour nematodes and other soil-borne pathogens. Seeds and pollen should be free of debris. If debris is present, it should be removed. If mandatory treatments are prescribed on the import permit or endorsements are required, these should be given by the relevant government authority exactly as requested. After treatments have been applied, they should be detailed on the phytosanitary certificate, together with any other endorsements requested by the importing country. The phytosanitary certificate should bear the stamp of the organization issuing the certificate and should be signed by an authorized officer. Many countries are now issuing phytosanitary certificates electronically with stamps and signatures added in the computer (known as ePhytos). These are equally valid and may ease on-arrival arrangements because they are increasingly sent to the importing country digitally soon after they are issued. The original phytosanitary certificate, plus a copy of the import permit, should accompany each consignment. Most importing countries will allow photocopies of import permits if there are multiple shipments, but it would be best to confirm this from the quarantine authorities of the importing country if there are any doubts. A copy of the import permit should be placed on the outside of the package so it can be forwarded to the plant quarantine authorities without the need to open it. A photocopy of the permit should be included inside the package in case of damage to the outside copy. However, this may vary from country to country. For example, regulations in the United States specify that all documents should be inside the package. A copy of all documents sent with the consignments should be retained by the collector. Collectors should keep a copy of the information accompanying each specimen. Samples of seeds and pollen may have to be sent for viability testing, as well as for inspection for internally-borne pathogens, and weeds. Samples should be properly dried before dispatch. Collectors should include the name of the person (and address) to whom the identification(s) should be sent. And what of the future? The challenge is for samples to move ever faster, and ever more safely, between countries, from places of collection to places of storage and other use. This requires collectors and quarantine officials to work together in more consistent and coherent ways – in itself a major challenge. Collectors and the users of plant germplasm would like quarantine officials to act faster. Quarantine officials (ever mindful of their mandate to protect crops and indigenous flora from new pest incursions) need time if they are to do their job thoroughly. Tensions can arise from these, seemingly, different ways of viewing germplasm, but this is a false dichotomy. All sides have to work together if satisfactory outcomes are to be achieved: the rapid international movement of germplasm safe from risk. If this is not achieved, there will be – or continue to be – adverse consequences. We know from anecdotal evidence that long delays in quarantine bring frustrations and, unfortunately, a temptation among some to short-circuit official systems, especially where these are not well developed. It is the responsibility of those sponsoring collecting missions to forbid such practices. So are there ways to reduce the time it takes to process samples, check for associated pests? Some suggestions are obvious: crop-specific guidelines for testing germplasm for the pests of concern need to be produced, and they need to be updated constantly. Those produced by Bioversity International (also under its previous names as IBPGR and IPGRI) are expensive to produce and become outdated too soon. This needs to change. Documents need to be posted on the internet, and frequent revisions made as new data comes to hand. The linking of institutes – international and national – dealing with indexing technologies of specific crops needs to continue. And conformity of national quarantine regulations needs to be achieved. There are still countries that re-index samples, no matter that they have been indexed elsewhere, causing considerable frustration to would-be users. Another question is whether molecular technologies can assist in speeding up the processing of germplasm samples. The most likely answer is both a “yes” and a “no”. Several current programmes that “fingerprint” and “bar-code” plants and animals will, undoubtedly, lead to speedy identifications of pests attached to germplasm being moved internationally. It may also speed up the process of determining whether pathogens are present within plant tissues. The problem, however, is what to do about the detection of DNA within a plant that differs from that of the plant itself, particularly if there are no symptoms of any kind. Currently, plants that are symptomless after months or years (most often a crop cycle) in quarantine are released to the importer. In future, national phytosanitary officials may have to deal with the quandary of what to do about symptomless plants containing apparently alien DNA. There is no guarantee that once released into a new environment the endophytic organism will not be transferred to another plant (perhaps by an insect vector) and become a pest. Decision making in this area is set to become extremely difficult. As mentioned already in this chapter, the internet has grown greatly over the years since this book was first published, and is now of immense value to researchers and national phytosanitary officials alike. They now have almost instant access to all the knowledge available on a particular organism, much of it being kept up to date. Perhaps the next phase, already beginning in some countries, will be to enable researchers, industry and governments to collaborate, use expertise, share data and information, and generate intelligence through the development of information technologies akin to the popular social networks. An example of this is the web portal of the Australian Biosecurity Intelligence Network (ABIN): www.abin.org.au/web/index.html. Development of biosecurity networks will be a challenge within countries where researchers may guard certain information prior to publication, but it will be even more challenging between countries where the trade implications of the presence or absence of a pest can have huge economic consequences. Nevertheless, the benefits of information sharing are already self-evident following the growth of the internet, and it is to be hoped that attempts at greater information sharing through networking will be equally positive. Countries throughout the world are keen to safeguard agriculture, forestry and the environment from potentially threatening invasive pest species. This commitment is regulated under the International Plant Protection Convention with support, in recent years, from the World Trade Organization’s Agreement on the Application of Sanitary and Phytosanitary Measures (the SPS Agreement). Governments apply measures for food safety and animal and plant health – sanitary and phytosanitary measures – to impede the spread of pests. Collectors of germplasm must be aware of these developments, and the potential harm that the unrestricted movement of germplasm could cause. They must ensure that samples conform to standards set under both national legislation and international regulations. Failure to do this could jeopardize collecting missions. AAB. 1985 et seq. Descriptions of Plant Viruses. Association of Applied Biologists, Wellesbourne, UK. Altieri MA. 1993. Ethnoscience and biodiversity: key elements in the design of sustainable pest management systems for small farmers in developing countries. Agriculture, Ecosystems and Environment 46:257–272. Bland RG, Jacques HE. 1978. How To Know Insects. WC Brown Company Publishers, Dubuque, Iowa. Borror DJ, Delong DM, Triplehorn CA. 1976. An Introduction to the Study of Insects. Holt, Rinehart and Winston, New York. British Museum (Natural History). 1974. Insects. Instructions for collectors No.4a. British Museum (Natural History), London. Brunt AA, Crabtree K, Gibbs A. 1990. Viruses of Tropical Plants. CAB International, Slough, UK. Brunt AA, Crabtree K, Dallwitz M, Gibbs A, Watson L, Zurcher E, editors. 1996. Plant Viruses Online: Descriptions and Lists from the VIDE Database. CAB International, Wallingford, UK. Available online (accessed 15 August 2011): www.agls.uidaho.edu/ebi/vdie/refs.htm. CMI/AAB. 1970-1984. Descriptions of Plant Viruses. Sets 1–18. CAB International and Association of Applied Biologists, Slough and Wellesbourne, UK. FAO. 1993. Directory of Regional Plant Protection Organizations and National Plant Quarantine Services. AGPP/Misc /93/1. FAO, Rome. FAO. 2011. International Standards for Phytosanitary Certificates. ISPM 12. FAO, Rome. Available online (accessed 15 August 2011): https://www.ippc.int/file_uploaded/1307528241_ISPM_12_2011_En_2011-05-03(Corre.pdf. Hall GS, Hawksworth DL. 1990. International Mycological Directory. CAB International, Wallingford, UK. Hewitt WB, Chiarappa L. 1977. Plant Health and Quarantine in International Transfer of Genetic Resources. CRC, Cleveland, Ohio. IIE. 1968 et seq. Distribution Maps of Pests. Series A (Agriculture). International Institute of Entomology (formerly Commonwealth Institute of Entomology) and CAB International, Wallingford, UK. IIP. 1972 et seq. IIP Descriptions of Plant-Parasitic Nematodes. International Institute of Parasitology (formerly Commonwealth Institute of Helminthology) and CAB International, Wallingford, UK. IMI. 1942 et seq. IMI Distribution Maps of Plant Diseases. International Mycological Institute (formerly Commonwealth Mycological Institute) and CAB International, Wallingford, UK. IMI. 1964 et seq. IMl Descriptions of Fungi and Bacteria. International Mycological Institute (formerly Commonwealth Mycological Institute) and CAB International, Wallingford, UK. IPPC. 2010. Glossary of Phytosanitary Terms. ISPM No. 5. International Plant Protection Convention, Rome. Available online (accessed 15 August 2011): https://www.ippc.int/file_uploaded/1273490046_ISPM_05_2010_E.pdf. Johnston A, Booth C. 1983. Plant Pathologist’s Pocketbook. CAB International, Wallingford, UK. Nelson SC, Bushe BC. 2006. Collecting Plant Disease and Insect Pest Samples for Problem Diagnosis. SCM-14. Cooperative Extension Service, University of Hawaii at Manoa, Honolulu, Hawaii. Available online (accessed 29 August 2011): www.ctahr.hawaii.edu/oc/freepubs/pdf/SCM-14.pdf. Sonoda RM. 1979. Collection and preservation of insects and pathogenic organisms. In: Mott GO, Jimenez A, editors. Handbook for the Collection, Preservation and Characterization of Tropical Forage Germplasm Resources. CIAT, Cali, Colombia. Waller JM, Lenné JM, Waller S. 2001. Plant Pathologists’ Pocketbook. 3rd Edition. CAB International, Wallingford, UK. Old KM, Vercoe TK, Floyd RB, Wingfield MJ, Roux J, Neser S, editors. 2002. Acacia spp. FAO/IPGRI Technical Guidelines for the Safe Movement of Germplasm No. 20. FAO/IPGRI, Rome. Diekmann M. 1997. FAO/IPGRI Technical Guidelines for the Safe Movement of Allium spp. FAO/IPGRI Technical Guidelines for the Safe Movement of Germplasm No. 18. FAO/IPGRI, Rome. Frison EA, Diekmann M, Nowell D, editors. 2000. FAO/IPGRI Technical Guidelines for the Safe Movement of Cocoa Germplasm. FAO/IPGRI Technical Guidelines for the Safe Movement of Germplasm No. 20. FAO/IPGRI, Rome. Frison EA, Feliu E, editors. 1991. FAO/IBPGR Technical Guidelines for the Safe Movement of Cassava Germplasm. FAO/IBPGR, Rome. Frison EA, Taber M, editors. 1991. FAO/IBPGR Technical Guidelines for the Safe Movement of Citrus Germplasm. FAO/IBPGR, Rome. Frison EA, Putter CAJ, Diekmann M, editors. 1993. FAO/IBPGR Technical Guidelines for the Safe Movement of Coconut Germplasm. FAO/IBPGR, Rome. Zettler FW, Jackson GVH, Frison EA. 1989 FAO/IBPGR Technical Guidelines for the Safe Movement of Edible Aroid Germplasm. FAO/IBPGR, Rome. Ciesla WM, Diekmann M, Putter CAJ, editors. 1996. Eucalyptus spp. FAO/IPGRI Technical Guidelines for the Safe Movement of Germplasm No. 17. FAO/IPGRI, ACIAR & ASEAN, Rome. Frison EA, lkin R, editors. 1991. FAO/IBPGR Technical Guidelines for the Safe Movement of Grapevine Germplasm. FAO/IBPGR, Rome. Frison EA, Bos L, Hamilton RI, Mathur SB, Taylor JD, editors. 1990. FAO/IBPGR Technical Guidelines for the Safe Movement of Legume Germplasm. FAO/IBPGR, Rome. Diekmann M, Putter CAJ. 1996. FAO/IPGRI Technical Guidelines for the Safe Movement of Musa Germplasm. FAO/IPGRI Technical Guidelines for the Safe Movement of Germplasm No. 15. 2nd Edition. FAO/IPGRI, Rome. Diekmann M, Sutherland JR, Nowell DC, Morales FJ, Allard G, editors. 2002. Pinus spp. FAO/IPGRI Technical Guidelines for the Safe Movement of Germplasm No. 21. FAO/IPGRI, Rome. Jeffries C J. 1998. Potato. FAO/IPGRI Technical Guidelines for the Safe Movement of Germplasm No. 19. FAO/IPGRI, Rome. Diekmann M, Frison EA, Putter CAJ, editors. 1994. FAO/IPGRI Technical Guidelines for the Safe Movement of Small Fruit Germplasm. FAO/IPGRI, Rome. Diekmann M, Putter CAJ, editors. 1995. Small Grain Temperate Cereals. FAO/IPGRI Technical Guidelines for the Safe Movement of Germplasm No. 14. FAO/IPGRI, Rome. Diekmann M, Putter CAJ, editors. 1994. FAO/IPGRI Technical Guidelines for the Safe Movement of Stone Fruit Germplasm. FAO / IPGRI Technical Guidelines for the Safe Movement of Germplasm No. 16. FAO/IPGRI, Rome. Frison EA, Putter CAJ, editors. 1993. FAO/IBPGR Technical Guidelines for the Safe Movement of Sugarcane Germplasm. FAO/IBPGR, Rome. Moyer JW, Jackson GVH, Frison EA. 1989. FAO/IBPGR Technical Guidelines for the Safe Movement of Sweet Potato Germplasm. FAO/IBPGR, Rome. Pearson MN, Jackson GVH, Zettler FW, Frison EA. 1991. FAO/IBPGR Technical Guidelines for the Safe Movement of Vanilla Germplasm. FAO/IBPGR, Rome. Brunt AA, Jackson GVH, Frison EA. 1989. FAO/IBPGR Technical Guidelines for the Safe Movement of Yam Germplasm. FAO/IBPGR, Rome.